Another big day for the Prison Chicks! I had a busy and intense day of training today. So VERY much to learn before Mary Beth goes on Friday. But, boy, she’s a great teacher, so I think I’m going to be just fine. Carl seems so nice, too. I think he’ll make a very fine boss. I couldn’t check email or voicemail while I was in training. I will admit, in the back of my mind, I constantly wondered what might be going on with the MCC chicks. As it turns out, what was happening decidedly equaled plenty. Around noon, or was it one? I don’t know. In the afternoon, I sat at the microptics station, wondering why Mary Beth’s Bat Fly seemed to stay pristinely atop the mound of prep material (KY jelly in a sea of 95% alcohol – and yes, I laughed the first time, too). My Bat Fly kept listing to the port side in an ugly fashion, making it unphotographable. I decided to take a quick break, so I went to get my cell phone in my old office. It rang in my hand. Was I jealous I couldn’t be there for the MCC banding? Well, hell yes. But, honestly? After hearing how excited everyone was and how happy Dan seemed after helping with his first banding, I kind of am glad I wasn’t able to go. That’s just too cool for school. I think it’s rather excellent that Dan, someone who has watched the MCC falcons waaaay longer than I have, was able to experience that. It’s something you never forget. After work, I went on my regular circuit around the jail and its environs. 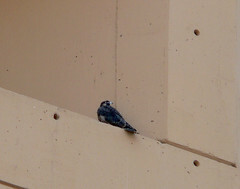 The nest ledge was completely empty. Was Chick #2 down in the nest? Did it fledge too? I guess we’ll find out. As for Chick #1, when Sean and I got home, I spent the evening watching. She sat on the edge of the EPA building, alternately flapping her wings wildly and hopping from one end to the other. One adult was with her at all times. We saw at least two occasions where Max (I could tell from the cheek patches) came up to feed her. ~ by Steph on June 21, 2007.